Is that euros per dollar? Wouldn’t that be a strengthening of the euro? TJ, no it is the other way around. EUR/USD is the normal notation. Thanks, I’ve seen that before and it still threw me off. Dumb question: what was the logic behind European demand for dollars as a result of this tightening? That the Fed and the ECB have both failed: also a good example of the fact that life is not always as linear as we want it to be in terms of progress. Even though a moment of greater understanding of monetary policy is clearly happening, not quite so on the part of the institutions where such understanding is most needed. So a prime goal now is to make sure our ‘two steps forward’ do not just end up as ten steps back, should people reject those insitutions with no real understanding as to why. Lars, could I get you to respond to this: http://econlog.econlib.org/archives/2012/07/the_magic_solut.html ? Also, isn’t it creepy just how many similarities there are between the Great Recession and the Great Depression? And, to what extent do you think that flight to liquidity in early 2008 + continuation of passive tightening since Dec 07 contributed to the mid-08 NGDP collapse in US? Or was it almost entirely transmitted from Europe? The “collapse of the US primary dealer system” occurred after the “flu turned into pneumonia” in mid-08, right? so the Fed had already screwed up by then. isn’t it creepy just how many similarities there are between the Great Recession and the Great Depression? See my forthcoming post on just this very point. And I have offered a comment on Arnold Kling’s query. You know that I think of devaluations and how they work. Arnold Kling is an interesting thinker, but I very rarely find myself in agreement with him. It is clear that he is think debt and leverage effects rather than understanding the monetary issues. It is unfortunately very, very common that people do not understand the impact of devaluations. In terms of 2007-8 there is no doubt that both the Fed and the ECB allowed monetary conditions to tighten too much and too fast well before the collapse of Lehman. The collapse of Lehman and therefore of the primary dealer system was a much bigger blow to the European banking sector which did not have direct access to dollar liquidity from the Fed. And yeah it is amazing how similar everything is to the Great Depression. Today we have a dollar standard and not a dollar standard. I have an idea that I want to write a book called “Green fetters” to honor Eichengreen’s book “Golden fetters”. Similiarly the second leg of the crisis (1931-32) was an European crisis as it is today. Europe played a much more important role in both the Great Depression and the Great Recession than is normally acknowledged. The GD was not caused by a stock market crash on Wall Street and the GR was not caused by a collapse in US housing. It was caused by European demand for gold/dollars. Food for thought: Globally, interest rates have been trending down for decades. If you extend the trend, you get to zero…and we are about there. Okay, zero is the new normal. See Japan. This means the conventional central bank tool for stimulus has been obliterated. It seems we can only go to QE. But what will this mean for central banks and taxpayers? Central banks will accumulate trillions in assets. Cut tax rates and transfer the money to national treasuries? You mis-diagnose cause & effect. Monetary policy works with lags. Monetary flows fell because Bernanke conducted 2 separate contractionary monetary policies. And prior to the 4th qtr 2008 M fell consistently faster than Vt.
2008-2009’s crash was the RESULT of Bernanke’s monetary policy blunder: which caused a cummulative & reinforcing contraction in bank credit. The payment of interest on excess reserve balances induced dis-intermediation within the non-banks (i.e., removed virtually all liquidity within the shadow banks) at the same time the economy was collapsing. Even as the Commerce Department said Retail sales increased by 1.2% over October 2006, and up a huge 6.3% from November 2006. No money supply figure standing alone is adequate as a “guide post” for monetary policy. And Income velocity = gdp/m. Shifts (deleveraging) in savings/investments between deposit classifications artificially increased “m” distorting any correlation between VI & NGDP. Income velocity is a contrived figure. You can’t target ngDp. Aggregate monetary demand is measured by monetary flows (MVt), not nominal GDP. Nominal gDp’s 2 year rate-of-change peaked in the 2nd qtr of 2006 @ 12%. Bernanke let it fall to 8% by the 4th qtr of 2007 (or by 33%). It fell to 6% in the 3rd qtr of 2008 (another 25%). It then plummeted to a -2% in the 2nd qtr of 2009 (another [gasp] – 133%). I.e., Bernanke initiated his first contractionary monetary policy beginning Feb 2006. Then Bernanke delivered the coup de grâce in the 4th qtr 2008 thru the 1st qtr 2009. Monetary policy objectives should not be in terms of any particular rate or range of growth of any monetary aggregate. Rather, policy should be formulated in terms of desired roc’s in monetary flows (MVt) relative to roc’s in real-gDp (not nominal gDp). This is evidenced by the price of crude oil peaking on 7/4/2008 @ $145.29 then falling to $37.51 on 2/13/2009. Likewise the Commodity Price Index peaked @ 219.65 in 7/2008 & plunged to 98.29 in 2/2009. Neither percentage decline can be explained in terms of the fluctuation in EUR/USD conversion rates. I.e., MVt = PT. For those who need a reminder, the equation of exchange is an algebraic way of stating a truism; that the product of the unit prices, & quantities of goods and services exchanged, is equal (for the same time period), to the product of the volume, & transactions velocity of money. The EUR/USD currency conversion rate peaked @ 1.5923 on 2008-07-15, & fell to 1.2446 on 2008-10-27. The EUR/USD bottomed on 2009-03-03 @ 1.2549. The EUR/USD now stands @ 1.2541 on 2012-06 (i.le., no change). to 1.581 on 2012-01-01. (the fluctuation in M1 velocity is more pronounced). Obviously the fall in Vi had nothing to do with the drop in the U.S. dollar. I don’t understand how central bankers can look at this stuff and be puzzled about what really happened and why things just keep getting worse. I appreciate flow’s comments here too, I’ve read a few Fed papers on the rationale for IOR and it talks about the lack of need for reserves due to the money being elsewhere in the system rather than in reserve accounts – an how it impacts the Fed’s ability to control monetary policy. Do you suppose that the shadow banking system was under stress because of the mbs and then Bernanke comes along and finishes it off? If that did happen, isn’t there some kind of responsibility to ensure that there’s enough reserves rather than just putting a pile of money there and if it isn’t enough just leave it? Dajeeps, look at money supply figures and NGDP and market movements in my view is sufficient to understand this crisis. I fundamentally agree with Hetzel’s analysis of the causes of the crisis. The US was heading for a slowdown in growth in 2007-8 and the back of the adjustment in the real estate market and the oil price shock. However, that is basically unrelated to what then unfolded – and that is the spike in dollar demand. I am not sure that Bernanke tightened monetary policy initially, but I certainly know he failed to increase the money supply enough to accommodate the increase in dollar demand. As I sketch I believe that the cause of this increase in dollar demand primarily came from Europe. I think it is pretty clear that there was an European bubble, but there was not necessarily a US bubble – at least that is not what caused the increase in dollar demand. The collapse of Lehman Brother obviously was important because it caused the total collapse of the Fed’s primary dealer system. That said, both the Fed and the ECB became increasingly hawkish (relative to what was needed) during 2008 and prior to the LB collapse. Both the Fed and the ECB obviously got confused by rising oil prices and headline inflation and failed to recognize the significant tightening of monetary conditions that we saw even before then collapse of LB. Perhaps the specifics don’t really matter, whether it was dollar demand from Europe or some internal issue – just look at the capital flight from Europe that keeps falling down the cliff. I was asking about the terribleness of the IOR policy, hoping to get it in terms I can understand. I don’t have any position to be arguing with whether it is contractionary, I’ve heard that it is and from the basic education in macro that I have, it looks like a very reasonable conclusion, except that I don’t know of any deeper meaning or details; for example, Bernanke did IOR and it sucked liquidity out of shadow banking causing the collapse. It sounded like that is what flow was saying, but it was buried in complex terms I don’t understand. Perhaps it’s the difference between a free market philosophy and more of an Orwellian central planing nightmare? European demand for investment gold skyrocketed in 2008 and has remained strong: the demand for non-euro assets was clearly strong. The Eurozone had nothing to do with the U.S. It’s Money & Banking 101. Bank lending expands the volume of money & directly affects the velocity of money, while intermediary lending directly affects only the velocity. Bernanke collapsed aggregate monetary demand as demonstrated by the roc in MVt as early as DEC 2007. When Bernanke introduced IOeR’s he induced dis-intermediation (where the size of the non-banks shrink, but the size of the CB system remains the same). IOeRs alter the construction of a normal yield curve, they INVERT the short-end segment of the YIELD CURVE – known as the money market. The 5 1/2 percent increase in REG Q ceilings on December 6, 1965 (applicable only to the commercial banking system), is analogous to the .25% remuneration rate on excess reserves introduced on Oct 9, 2008 (i.e., the remuneration rate @ .25% is higher than the daily Treasury yield curve almost 2 years out – .27% on 4/18/12). In 1966, it was the lack of mortgage funds, rather than their cost (like ZIRP today), that spawned the credit crisis & collapsed the housing industry. I.e., it was dis-intermediation (an outflow of funds from the non-banks). The fifth (in a series of rate increases), promulgated by the Board and the FDIC beginning in January 1957, was unique in that it was the first increase that permitted the commercial banks to pay higher rates on savings, than savings & loans & the mutual savings banks could competitively meet (like the CB’s IOeRs now compete with other financial assets [held by the non-banks], on the short-end of the INVERTED yield curve). Bankers, confronted with a remuneration rate that is higher (vis a’ vis), other competitive financial instruments, will hold a higher level of un-used excess reserves (i.e., will both 1. absorb existing bank deposits within the CB system, as well as 2. attract monetary savings from the Shadow Banks). i thought about why there is a common impulse, and it puzzles me. However, one notion i come back to is the common role of inflation targeting, and the fact that the inflation measures the developed world use as targets are heavily influenced by oil and commodities prices, which are driven by world demand. In 2008, when oil and commodities rapidly rose, headline inflation measures were high. In sept 2008, the Fed held rates steady at 2% due to inflation fears, even though business conditions deteriorated and Lehman collapsed. If developed economies are inflation targeting, and the inflation measure is heavily influenced by oil/import prices, then what we have is a defacto gold standard and common transmission mechanism. 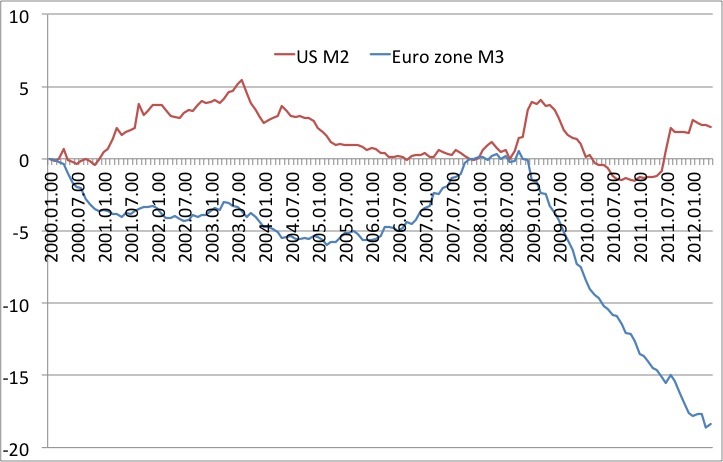 Because of the de facto focus on headline inflation in both the US and the euro zone in 2007-8 both central banks were far to slow to ease monetary policy. But the shock in my view came from increased European demand for dollars. The Primary Dealer’s network mal-functioned as a direct result of the Fed’s extraordinarily tight money policy. Lars: an important, and surprising (to me) finding. I wonder if other countries like UK and Denmark look more like the US or more like the eurozone? 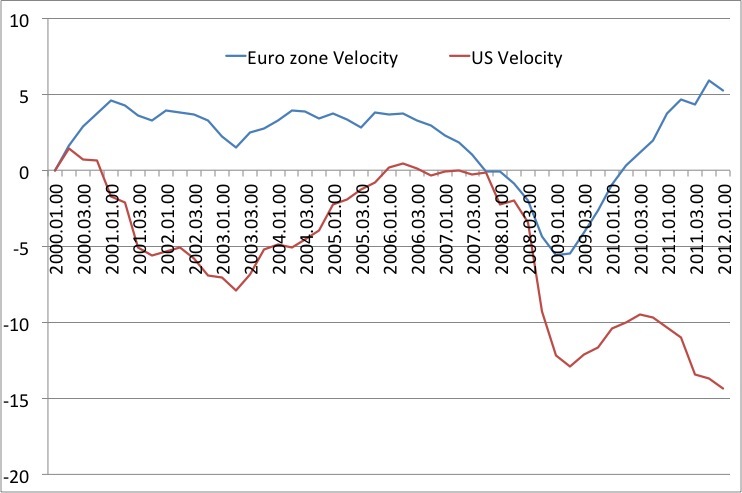 Is it the USDollar’s status as a reserve currency that drives the link between Euro money supply and US velocity? I agree – the Great Recession is many ways is a copy-paste of the Great Depression in terms of the mechanisms in place – and that is despite of a very different currency regime. I think the fact that the dollar is a reserve currency is played a huge role. The global financial system operates on a dollar standard. It is not Golden Fetters – it is Green Fetters. Other reserve currencies and quasi-reserve currencies as far as I can judge saw a similar contraction in velocity as in the US. While none-reserve currencies did see the opposite. I don’t think it is a coincidence that countries like Poland, Sweden and Turkey came through the Great Recession with a minor correction in growth and a fast recovery. Demand of these countries currencies DROPPED when the crisis hit and at the same time these countries’ central banks moved to ease monetary policy – no wonder than recovered fast. Denmark is somewhat different due to the pegged exchange rate. Furthermore, in Denmark the government’s debt office sharply increased the government’s cash holdings causing an very unwarranted contraction in the money supply in 2008, 2009 and 2010. Interestingly enough one should have a look at Sweden in the present situation. Recently the Swedish krona has strengthened quite a bit as the euro crisis as escalated – indicating that the krona today is a “safe haven” or a quasi-reserve currency. So while the markets caused a “passive” easing of Swedish monetary condition the opposite is the case today. One of the preconditions the U.S. needed in 1929 was a much larger national debt, and a willingness on the part of the Congress, the Administration, and the business community to tolerate an adequate expansion of the national debt. In 1929 the national debt was less than $17 billion, and the banks held only a small proportion of that amount. We needed a larger debt and a much more rapidly expanding debt in the 1930’s, not only to “prime-the pump”, but to meet the monetary management needs of the Fed. Note: Both Roosevelt and Hoover in 1932 ran on platforms calling for balanced budgets. It was true, as the Keynesians insisted, that monetary policy didn’t matter; fiscal policy was everything. No more. The foreseeable future holds the prospect of sharply declining levels of consumption for the vast majority of the American people, who will be facing years of stagflation. It is probable that we will never be able to dig ourselves out of the present morass of debt and still operate the economy within the framework of a free capitalistic system. It was not until 1933 that we began to unshackle our paper money from the numerous and unnecessary restrictions pertaining to its issuance. With the numerous types of paper money in circulation at the time, this would seem to have been a non-problem. Here is the list: gold certificates, silver certificates, national bank notes, United States notes, Treasury notes of 1890, Federal Reserve Bank notes, and Federal Reserve notes. With that array of paper money there should have been plenty to meet the liquidity demands placed on the banks by the public. But the volume of each type that could be issued was so circumscribed by restrictions that even the aggregate group could not begin to meet the panic demands of the public. For all of the Great Depression legal reserve management was impossible even though the Banking Act of 1933 provided for the coordination of all open market operations through the New York Reserve bank. (that is to say, before 1933 one FRB could be conducting operations of the buying type — expanding credit, creating bank free-gratis legal reserves and laying the foundation for a multiple expansion of money, while another FRB was doing the opposite, — conducting open market operations of the selling type) Before April 1933 any excess free-gratis legal reserves in the system were quickly wiped out by the massive “runs” on the banks. Between mid-September and the end of December 1931, currency held by the public rose $544 million (11 percent). We now actually have a central bank. It is called the Federal Reserve Bank of New York. An amendment to the Federal Reserve Act in 1933 established The Federal Open-Market Committee and gave it the power to control Total Reserve Bank Credit. The Fed can now buy an unlimited volume of earning assets. (With the federal debt at over 12 trillion, and expanding, and billions of dollars of “eligible paper” available, the term “unlimited” is not an exaggeration in terms of any potential needs of the Fed.) In the process of buying Treasury Bills etc., new Inter-Bank Demand Deposits (IBDDs) are created. These deposits can be cashed by the banks into Federal Reserve Notes, without limit, on a dollar-to-dollar basis. It is still true that “when the U.S. sneezes the rest of the world catches a cold”. For example, some people think Feb 27, 2007 started across the ocean. I.e. : “On Feb. 28, Bernanke told the House Budget Committee he could see no single factor that caused the market’s pullback a day earlier”. In fact, the U.S. market’s decline was irrefutably home grown (& it was the seventh biggest one-day point drop ever for the Dow). Alfred Marshall, the Cambridge economists, is responsible for developing the cash-balances approach to money explaining this. That is, money is truly a paradox – by wanting more, the public ends up with less, & by wanting less, it ends up with more. All motives which induce the holding of a larger volume of money will tend to increase the demand for money – & reduce its velocity. What is construed as foreign money demand actually just reflects the global market’s interconnectedness. Bernanke once again initiated a protracted tightening of monetary policy, a cumulative & reinforcing contraction of bank credit. Responding to Bernanke’s tight money policy, the prudential reserve Eurodollar system contracted in sync. Euro-dollar deposits circulate in many countries worldwide, but they continue to be referred to as “Eurodollars” regardless of the location, e.g., Yaun-dollars, Yen-dollars, Petro-dollars, etc. The Eurodollar (E-D) system came about precisely because the U.S. balance of payments deficits had finally supplied a more than adequate volume of international liquidity (liquidity Bernanke drained). The prudential reserves of the E-D banks consist of various U.S. dollar-denominated liquid assets (U.S. Treasury bills, U.S. commercial bank CDs, repurchase agreements, etc.) & interbank demand deposits held in U.S. banks. These are liquid balances in the U.S., or any other major currency country. The volume of prudential reserves held by each E-D bank presumably is dictated by “prudence” – not by any legal requirement administered by a monetary authority (nor by exchange controls). All prudential reserve banking systems have heretofore “come a cropper”. Money creation by private profit institutions is not self-regulatory- the “unseen hand” simply does not function in this area. Invariably the systems created too much money, speculation became rampant, inflation distorted & destroyed economic relationships, confidence that the banks could meet their convertibility obligations eroded, etc. ED’s can’t be defended as being in any way superior to the USDs as an international reserve & transactions currency since the acceptability of the EDs is totally dependent on the acceptability of USDs. The E-D system simply repeated the tragic record of all previous prudential reserve banking systems (when there was no lender of last resort). As the E-D system contracted (experienced dis-intermediation), the demand for money (USDs) accelerated. How does a rise in dollar demand lead to a fall in USD money-velocity? Is it because market participants demand dollar deposits, but don’t use them for transactions (or use them for fewer transactions than before)? Or what is the logic behind this? It follows by definition that an increase in the money demand (dollar demand) will push down money-velocity (for a fixed money supply). I know this is old and probably will not get the answer but what caused the dollar demand in euro? was it slowdown in US ?